You can choose from two wood species; Standard or Premium. Which type of timber should I choose? Or Kit only; the assembly kit delivered extra fast, within 24 hours. The timber must then be purchased at the local hardware store, DIY or garden center with the supplied timberlist. You are flexible to choose the wood species yourself. What happens if we provide super cool modular elements, and let you(r creativity run wild) designing your own perfect playset? Endless possibilities! We’ll show you how to get started below and let you in on all tips & tricks on the way. Once you enter the Design Your Own zone you can easily “mix & match” which setup suits your family and garden best. Our extensive collection of climbing frames consists of 22 different play towers and playhouses that can be customised with one, two or even three of the 12 Jungle Gym modules. Each individual component is designed with attention and care, so we can proudly leave the design of the climbing frame up to you. Custom design was never this easy. You design it - We make it - We deliver. Release your inner designer. Do you want to give it a try and create your perfect wooden playtower? 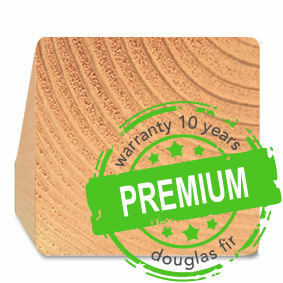 Premium Timber: Douglas is one of the hardest European pinewood species and has superior strength properties. It is prefered by professionals in the furniture and construction industries for its good structural and aesthetic properties. Douglas is considered one of the most sustainable coniferous wood species. Due its natural durability, the Douglas wood can be used outdoors without any additional chemical treatment. This type of timber contains no toxic substances or allergens and has a considerably lower splintering and resin formation compared to other pinewood species. Natural Douglas has an exclusive and warm appearance due to the flame structure and the orange color. See our timber page for more information. 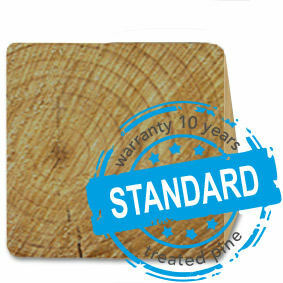 Standard Timber: Pine is a woodspecies with an excellent price-quality ratio. This pinewood has been valued for centuries for its natural constructive properties and is the most widely used timber species in Europe. Environmental friendly chrome-free impregnation increases its durability, protects against wood rot and and makes it suitable for outdoor use. See our timber page for more information. Kit Only (no timber): Do you love a good DIY project? This kit contains everything you need except for the timber; this means hardware, tools, accessories, construction brackets, safety features and the step-by-step illustrated assembly manual. Take the included timberlist to your local DIY store to get the necessary timber parts and build your own Climbing Frame. 22 playtowers with different styles and features to start your design. How to choose? Browse to find your style, read about some of the features below and use the filters on the left side of the page to narrow it down to your favorite wooden playtowers. Timber: Check out which timber types are available and select the timber type that you prefer to view only these play towers. Or select the Kit Only (no timber) option; the kit contains everything you need except for the timber. Take the included timberlist to your local DIY store to get the necessary timber parts. Climb Elements: Do you prefer a straight or sloping ladder? Jungle Gym ladders are the incredibly strong, weather resistant and durable; with anti-slip coated metal rungs, ergonomically rounded to create a natural, safe grip & grab using both hands and feet. Or how about a challenging climbing wall with colourful rocks, a cool rope ladder or a combination? Sliding: the Wavy Star Slide XL matches all playtowers with a 125 cm play deck height, the Wavy Star Slide XXL matches the playtowers with a 145 cm play deck height. Good to know: instead of a slide, the Fireman’s Pole matches all playtowers and is a real space saver for smaller gardens. Roof material: Play in the shade or hide from the rain under a classic wooden roof or contemporary Roof Tarp, the choice is yours. Jungle Gym Roof Tarp is made of high performance material; 3-layer technology with excellent renewed shape retention, with aluminum eyelets for smooth fixation, heat-sealed to prevent fray and tear, in lasting UV-resistant sky blue on the outside and jungle green on the inside. With Jungle Gym authenticity patch. Roof style: Your garden - your family - your style. A traditional gabled roof, eye-catching arched, unique saltbox or matching the roof of your home? Play Deck: Jungle Gym playtowers come in play decks of 125 cm or 145 cm high, the perfect heights to match either the Wavy Star Slide XL or XXL. For extra fun and perspective, some playtowers are equipped with an extra play deck either higher or lower. You can select the play deck height of your preference, but also if it’s partly or fully covered, and those with extra headroom (the space between play deck and roof) for taller kids. This is the part where you get creative. Multiple sides of the playtower (left / right / back / front) offer a wide selection of add-on modules to choose from. If a specific module is not listed on one side this is due to safety reasons such as preventing to bump into each other while playing different play elements (e.g. swing and ladder). Try another side or module! At Jungle Gym we solely provide the safest climbing frame designs determined by our specialised team for optimal safety. Last but not least: choose your favorite slide color or the fireman’s pole - a real space saver. Check the top view in the top right corner for the dimensions of your own custom designed climbing frame. Good to know that these dimensions are rounded-off. For more detailed dimensions use the image measurements on the separate product pages of the playtowers, playhouses and modules. Make sure that there no striped swing / play areas that overlap here. Now you’re ready to order your own custom designed climbing frame. All our climbing frames are easy to assemble yourself, with the included step by step instructions. Did you love designing your own climbing frame, but not so much the idea of setting it up? Good news: we offer assembly services.